As 1,200 delegates gather in Hannover for the 14th annual Routes Europe, Routesonline reveals the continent’s top ten busiest international passenger routes and looks at the services which have grown at the fastest rate over the last 12 months. 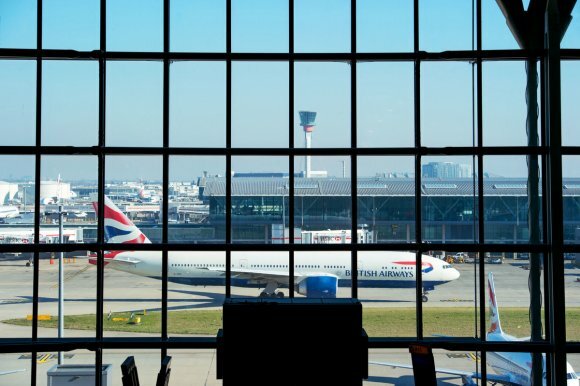 With almost three million passengers flying the 5,500 km journey, the route between Heathrow Airport and New York John F. Kennedy International Airport has taken the crown as Europe’s busiest international scheduled service, research by Routesonline has found. The ascent of London Heathrow - New York John F Kennedy to the position as the busiest international route to/from and within Europe followed a 16.6 percent year-on-year decline in the number of passengers flying between London Heathrow and Dubai International. 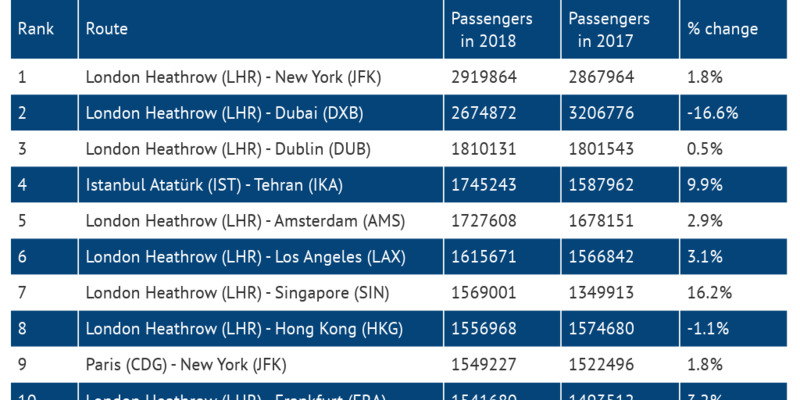 Figures from Sabre show that 2,674,872 passengers flew non-stop between the UK’s busiest airport and the United Arab Emirates city in 2018, down from 3,206,776 a year earlier. Five airlines served the market although two of them - Qantas Airways and Royal Brunei Airlines - ended service during the year. Completing the top three is the short 449km flight between London Heathrow and Dublin Airport, the capital of Ireland. The route is a duopoly between Aer Lingus and British Airways, both owned by International Airlines Group, which had a 65 percent and 35 percent share of the market respectively. In total, London Heathrow appears in eight of the top ten busiest international routes to/from and within Europe, underlining its position as a major global hub. Only Istanbul Atatürk (IST) - Tehran Imam Khomeini International Apt in fourth and Paris-Charles de Gaulle Airport - New York John F. Kennedy in ninth did not feature the UK airport. Routesonline’s research also found the ten major international routes which have grown at the fastest rate over the last 12 months. This was compiled by ranking the top 100 routes to/from and within Europe during 2018 by passenger numbers and calculating the percentage change from 2017. 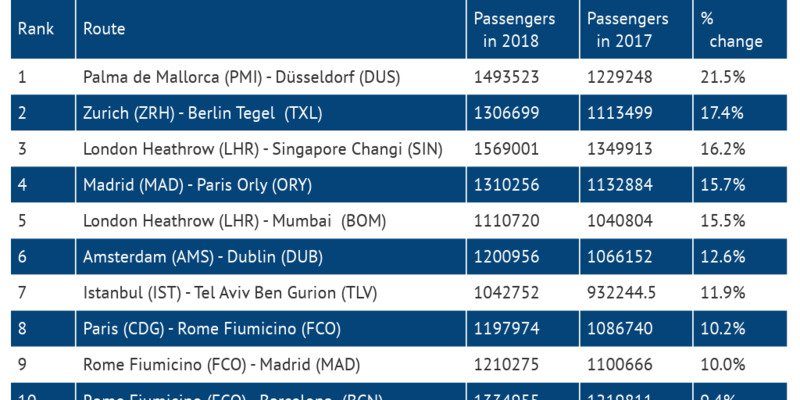 At number one is Dusseldorf Airport - Palma de Mallorca Airport, with passenger numbers increasing by 21.5 percent year-on-year to almost 1.5 million in 2018. The rise between the city in western Germany and the Balearic holiday destination was fuelled by a 29 percent rise in two-way seat capacity as carriers rushed to fill the void left by the failures of Air Berlin and NIKI. 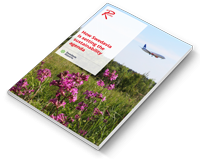 According to OAG Schedules Analyser, Condor Flugdienst, Eurowings, TUI fly and Norwegian all increased capacity on the route, while Ryanair-backed Laudamotion entered the market. The second fastest-growing international route within the top 100 is between Berlin Tegel and Zurich Airport. Passenger numbers increased to 1,306,699, figures from Sabre show, which equates to a year-on-year rise of 17.4 percent. This route was also affected by the demise of Air Berlin, which offered more than 550,000 two way seats in 2017. Low-cost carrier easyJet entered the market and offered an almost identical number of seats in 2018 to the total offered by Air Berlin a year earlier, while SWISS upped its capacity by 58 percent to almost 1.2 million seats. With a 16.2 percent increase, London Heathrow - Singapore Changi ranks as the third fastest-growing major international route. As noted earlier, Qantas’ decision to reroute its Sydney - London Heathrow flight via Singapore was a primary factor for the growth. According to OAG figures, more than 270,000 seats were offered by Australia’s flag carrier in 2018, compared with zero in 2017. Singapore Airlines also increased capacity on the route by 4.6 percent to in excess of 1 million two-way seats. The top five is completed by AENA - Paris-Orly Airport, which registered year-on-year passenger growth of 15.7 percent, followed by London Heathrow - Mumbai International Airport Pvt. Ltd., which grew at a rate of 15.5 percent.